In a new crime committed by Israeli settlers against Palestinian civilians, on Thursday morning, 18 May 2017, an Israeli settler killed a Palestinian civilian and wounded a photojournalist. The Palestinian Center for Human Rights (PCHR) condemns this new crime and stresses that Israeli forces should assume full responsibility for it. PCHR also emphasizes that Israeli forces continue to cover settlers’ crimes and even support and offer them permanent protection in addition to not subjecting them to the law. All of these practices encourage settlers to continue committing crimes against Palestinian civilians. Moreover, PCHR believes that these crimes are part of the ongoing incitement by the Israeli government against Palestinians, pushing settlers to further extremism and hatred against Palestinians. In light of the Israeli government’s silence towards settlers’ crimes, PCHR calls upon the international community to immediately take serious steps to offer protection for the Palestinian civilians in the occupied Palestinian territory (oPt). According to PCHR’s investigations and eyewitnesses’ testimonies, at approximately 11:30 today, dozens of Palestinian civilians made their way from the center of Nablus via buses towards Howarah village, south of the city. The buses stopped in front of the Education Directorate building, south of Nablus, on the main Ramallah-Nablus Street. After civilians stepped out of the buses, some of them started closing the street from both sides in light of steps in solidarity with Palestinian prisoners’ legitimate demands in the Israeli jails on their 32nd day of an open hunger strike. At approximately 12:10, a white car with an Israeli registration plate and travelled by a settler wearing a Kibbah on his head was heading from Za’atarah Intersection towards Nablus. After passing the cars with high speed, the driver attempted to run over a number of protesters. When a Palestinian ambulance driver saw the settler, he stopped the settlers’ car. The settler then took his gun out and opened fire at the protestors. As a result, Mo’ataz Hussein Helal Bani Shamsah (22), from Bita village, south of Nablus, was hit with a bullet to the head and immediately died. Moreover, Majdi Mohammed Soliman Ishtayah (35), a photojournalist at Associated Press Agency, was hit with a bullet to the right hand. 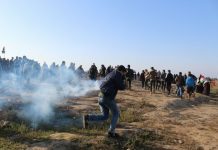 An Israeli military vehicle then arrived at the scene, and the soldiers heavily fired tear gas canisters at the Palestinian protestors to disperse them and evacuate the settler from the area. Reminds the international community that settlement activity is by itself a war crime according to the rules of the international law. Thus, all the High Contracting Parties to the Fourth Geneva Convention, individually or jointly, should take their legal and moral responsibilities, fulfill their obligations, and guarantee Israel’s respect for and application of the Convention in the oPt according to Article 1 of the Convention.